More on the neo-Nazi rally in Charlottesville, Virginia, where a would-be white supremacist is casting off his white polo, cap and khakis (apparently dressing like a golfer makes you a fascist. Who knew? Discuss) and tells the counter-demonstrators chasing him he’s not Nazi. He’s just playing dress-ups and shouting in public. He might even be golfer in the wrong place at the wrong time. Since I’m a person of color, my identity is not a uniform I can take off when I am feeling unsafe—when I’m stopped by police or when my white girlfriend and I travel through southern towns where Confederate flags billow from porches and pickup trucks. Like all minorities, I’ve grown used to the way that difference marks me—the burden of being ever ready for the moment my skin turns me into a target for angry white men determined to take back what they think the world owes them. 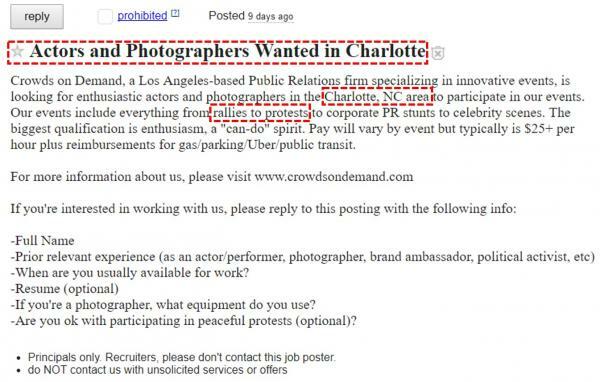 Crowds on Demand, a Los Angeles-based Public Relations firm specializing in innovative events, is looking for enthusiastic actors and photographers in the Charlotte, NC area to participate in our events. Our events include everything from rallies to protests to corporate PR stunts to celebrity scenes. The biggest qualification is enthusiasm, a “can-do” spirit. Pay will vary by event but typically is $25+ per hour plus reimbursements for gas/parking/Uber/public transit. If you’re a photographer, what equipment do you use? Fake news isn’t just being made in journalism boiler rooms; it’s being made on the street.